I never remember what fork to use! I am always scared I am going to use the wrong spoon. The truth is you do not have to know which fork to use. In fact, you will never know all the “rules” of etiquette. These customs and rules change over time. Responding to Invitations: You may be busy but taking the time to let the host know you are coming or not coming to a gathering will ensure that there is enough food and drink for everyone attending and perhaps even enough places for all the guests to sit down. Writing Thank You Notes: It is always nice to sent a note of thanks for a kindness. It is particularly important for gifts that are sent and that you do not open in front of the giver. If you do not sent a note or a message in another way, how will they know that you received it? Cell Phones In Public: Cell phones have become an important part of all of our lives. However, the world should not be a part of every conversation you make. Hearing private information can make people around you uncomfortable and could possibly give information to someone who should not have it. Also, the person checking you out of the grocery or doctor’s office can do so more quickly if you give them all of your attention. This helps not only the clerk but also there person after you. If you remember the words of Emily Post you will likely always figure out what to do. Consideration for the rights and feelings of others…, the very foundation upon which social life is built. P.S. For dining, always work from the outside in. 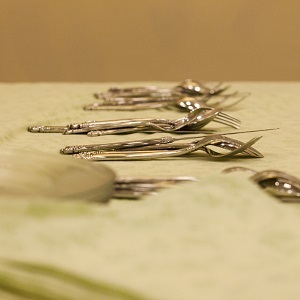 It is your host’s job to consider you and place the utensels in the correct order according to what is being served. < Previous News: Friday is Almost Here!